Do you have Henry Ford's priceless punchbowl? Henry Ford won a punchbowl in 1901 after winning his first auto race at the Detroit Driving Club in Grosse Pointe, MI. (It was a simpler time, prize-wise.) That bowl was auctioned off during the 1950s. Now, Ford wants it back, and you may have it. 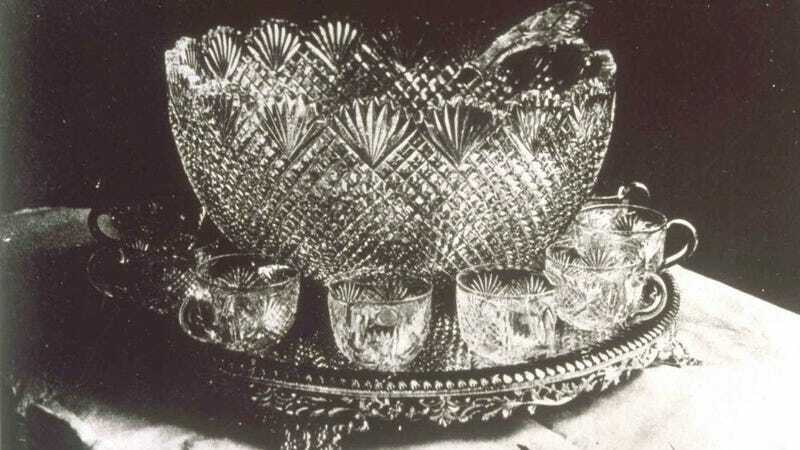 According to Hemmings, the cut-glass bowl was sold with many of the Fords' possessions after Henry's wife Clara Ford's death in 1950, but there are no records documenting who the purchaser was. Was it your grandparents? As the racing story goes, Henry Ford wanted to start an auto company, but couldn't snag enough investors to get the project going. His plan was to compete in the 25-lap race with a car he dubbed Sweepstakes, hoping to attract interest. The race was eventually shortened to 10 laps. Winton's car had a distinct horsepower advantage, and he took a big lead. Halfway through the race, Ford started closing in. On lap seven, Winton's car began smoking and sputtering, and Ford passed in front of the grandstand. He won by a wide margin. Naturally, investors stepped in and, well, that was that. Ford took the punch bowl home, which is why we now say "You're in the punch bowl!" when someone wins a race against a blowhard from Ohio. And who knows how many people have been served punch from Henry's bowl over the years. If you think you're in possession of Henry's bowl, get in touch with the Benson Ford Research Center.